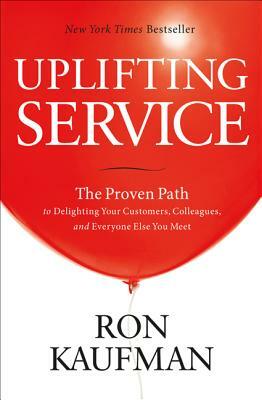 Uplifting Service: The Proven Path to Delighting Your Customers, Colleagues, and Everyone Else You MeetWe are deep in a service crisis. In the operating room, surgeons and their teams communicate in a very precise language; airplane pilots follow a strict protocol to take off and land safely every time; and, when launching a new product, companies lay out a plan that all employees follow. But when it comes to building a strong service culture, the path to success is usually much less clear. We relegate service to a single department guided by anecdotal wisdom and less-than-helpful cliches like the customer is always right.With global economies transforming at record speed, we are largely unprepared for the service demands we face day and night from around the world. We promise our customers satisfaction and then allow internal politics and inefficient methods to frustrate our ability to deliver. With service so much a part of our daily lives, both in and outside the workplace, why aren't we doing it better? New York Times bestselling author Ron Kaufman knows the answer to this question, and not only believes we can do it better, but shows us how. In Uplifting Service he takes you on a journey into a new world of service that is guided by fundamental principles and actionable models. After more than two decades helping leaders transform their service cultures, Kaufman has discovered that while each successful team is different, the architecture they apply to build an uplifting service culture is the same.In this New York Times, USA Today, and Amazon.com bestselling book, Kaufman lays out the steps you can take to build a sustainable culture that delivers outstanding service every day. He offers the tools and practices that have been proven effective in businesses, governments, communities, and homes; on every continent; and in many languages. Through perspective-changing insights and case studies, you will learn how the world's best performing companies have changed the game through service and how you too can follow this proven path to an uplifting transformation. Ron Kaufman, the founder of UP! Your Service, is the world's premiere thought-leader, educator, and motivator for uplifting customer service and building service cultures.Ron is a columnist at Bloomberg Businessweek and he has been featured in The Wall Street Journal, The New York Times, and USA Today. With powerful insights from working with clients all over the world in every major industry for more than two decades, Ron is an inspiration to leaders and managers in his high-content, high-energy speeches and impactful, interactive workshops. He is rated one of the world's Top 25 Who's Hot speakers by Speaker Magazine. Ron is passionately committed to uplifting the spirit of service worldwide. “Uplifting Service is one book every leader must read and every service provider should embrace as their guide. Read it, apply it, and then recommend your customers read it. This book will immediately elevate the value of your relationships. I have witnessed and walked on this proven path and have seen the results that follow. Now is the right time for you and your customers to experience this uplifting transformation as well." “When it comes to delivering world class service, Ron Kaufman understands two things. First, providing exemplary service is an organization-wide, all hands process, not just smiles over the phone or isolated heroics. Second, he understands how to help organizations internalize this service paradigm until it becomes part of their DNA and their customer loyalty soars. In Uplifting Service Ron provides a proven and practical roadmap for making this happen." “Uplifting Service reveals the ‘big picture’ and the power of service today. Ron Kaufman gives every company the tools to build a client base of Raving Fans!" “In Uplifting Service, Ron Kaufman convincingly reveals why the right kind of service can transform your business, and he also provides a detailed and easy-to-follow blueprint. Every CEO, manager and employee who provides service to others should not only read this book, but use it as an ongoing reference."